mommy's reviews: Enjoy Fantastic Portion Control With Yum Yum Dish!! Enjoy Fantastic Portion Control With Yum Yum Dish!! We have just begun a new year and I bet I can tell you what most people's new year's resolution is for 2012. I know it has been mine in the past and that resolution is to lose weight. Yes, I am sure we have all added a few pounds here and there from the holidays...although because I am pregnant, I have an excuse. HA HA!! Seriously though, if your new year's resolution is to lose some weight then this next review will be sure to interest you. I believe that it isn't a program, course, pill or drink that causes a person to lose weight. My personal opinion is that in order to properly lose weight you need to focus on portion control. It isn't what you eat, it is how much you eat. My husband is a good example of this. He is 6' 2" and looks like a bean pole. He is very thin and I cannot for the life of me figure out why. The reason I cannot figure this out is because he eats so much junk food, absolutely despises vegetables and lives on carbohydrates. BUT, even with all of his unhealthy habits he still maintains his slim figure. When you see how much food he eats, it makes perfect sense. He doesn't pig out at all. He will have maybe 1 or 2 pieces of chocolate and be done. I could eat a whole bag in one setting. So, I definitely believe that portion control is everything. All that said, I would like to once again introduce you to the Yum Yum Dish. I did a review for this delightful company about a year ago and in that review I talked about the small dishes that Yum Yum Dish makes for snacking. They are so cute!! :) Well, there is a new dish out there and this one is great as well!!! The 9 Inch Dinner Plate is the newest addition to the Yum Yum Dish family and I have the opportunity to review this product today. "After my second child was born I realized I was snacking too much. I'd drag a bag of chips off the shelf and head for the couch. Before I knew it, half the bag was gone. The fact is, I didn't realize how much I was eating. I decided to do something about it.I started using a small dish for snacking. As long as I didn't re-fill the bowl, I could never over-snack! In a short time, I was back to my original weight. I thought others might like to try out this simple method of portion control. The Yum Yum Dish was born, a 4 oz. dish that's fun and easy to understand. The Yum Yum Dish is perfect for children, teens, and adults who want to enjoy all their favorite foods in moderation. Not concerned with portion control? Use these hand-painted dishes for sauces, dips, entertaining, and more. A Yum Yum dish is a creative gift for the foodie in your life and a smart addition to any weight loss plan." Hmmmm...this sounds like my story! Have a baby, lose the weight and then gain it all back again. Ugg..VERY frustrating! Portion control is my problem and I definitely need all the help I can get in that area. So, for this review I received the brand new 9" Dinner Plate. You know, I didn't realize just how small 9 inches was! LOL! It isn't that much but if you are concerned with how much you are eating, it is perfect. I got out my new plate to have dinner the other night and here is what I was planning on eating. I was going to have a sandwich, grapes and some crunchy cheese curls. Sounds like a nice dinner, right? Well, I flopped my bread on the plate and I had NO ROOM for anything else. Hee hee...I broke the rules and had everything I had planned on having in the first place. What I love about this plate is that they print the outlines of how much of each food group you are allowed to have. I have a hard time picturing how much I am allowed so this is perfect! As with all the Yum Yum Dishes, you are "told" by the plate when you are done as it has "Yum Yum Time Is Over" printed on the surface of the plate. So, when you are done, you are DONE. 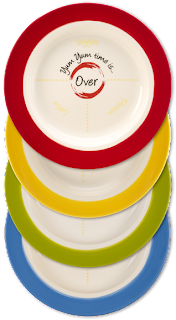 These new Yum Yum 9" Dinner Plates are wonderful...they come in sets of 4 in bright colors and a set retails for $29. I have a special discount code that has been set up especially for my readers! This code is for 20% off your entire order and the code is (all caps) FREEBIES4U. Keep in mind that this code is only valid from now until 1/20. Disclaimer: I received no monetary compensation for this post. I did receive a free Yum Yum 9" Dinner Plate for review purposes. All quotes and stock photos are from the Yum Yum Dish website and email. All thoughts and opinions are 100% mine.